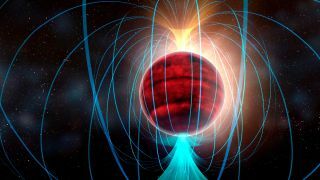 This artist's interpretation shows the magnetic field lines around an ultracool red dwarf star. New research suggests that stars like this may be a hive of activity, ejecting flares that could inhibit the evolution of life. A small, cool star is emitting flares 10,000 times brighter than those ejected by the sun, a find that could be bad news for those hoping to find the galaxy filled with life. The star's massive bursts of radiation, revealed in new research, could inhibit the evolution of life on planets orbiting the star, or at least severely disrupt it. If other stars of this type also have such intense flares, it could mean life in the universe is less likely to develop. "In fact, it might be extremely difficult for life to evolve at all in such a stormy environment," Williams said in the statement. Dim red dwarf stars dominate in the Milky Way, making up about three-fourths of the stellar population of the galaxy. The well-known star Williams targeted is a cool red dwarf, less than 1 percent as massive as the sun. It lies about 35 light-years from Earth, in the constellation Boites. Previous studies of the star from the Karl G. Jansky Very Large Array in New Mexico revealed that the tiny star has a magnetic field several times stronger than the sun, although the physical processes that build the sun's magnetic field shouldn't work for such a small star. "This star is a very different beast from our sun, magnetically speaking," CfA co-author Edo Berger said. Williams and his team turned ALMA's powerful focus toward the tiny star, making the first detections of flarelike emissions from a red dwarf star at such high frequencies. The bursts of light created by the flares are 10,000 times brighter than those produced by the sun. Their presence in the short window of observations suggests that such flares are constantly being produced. In their research, which has been accepted for publication in The Astrophysical Journal, the scientists named ALMA's extreme sensitivity as the key to detecting the flares. The measurement not only reveals more about the tiny star, but also opens the door to investigating other ultracool red dwarfs. If such emission is consistent across red dwarfs, it could mean bad news for the ability of life to evolve in the galaxy. Red dwarfs dominate the Milky Way, making up about three-fourths of all stars. Since NASA's Kepler telescope found planets around these worlds, the debate over whether or not they could host life has gone back and forth. In order to hold liquid water on its surface, a condition necessary for life to evolve, a planet orbiting a dim red dwarf must lie significantly closer to its star than Earth lies to the sun. This region is known as the habitable zone. But its close proximity puts the planet at risk from stellar flares and coronal mass ejections, bursts of charged particles that stream out from a star. Stellar winds also carry charged particles away, potentially toward the planet. If radiation reaches the surface of a planet, it can be damaging for any life growing there. Earth has a thick atmosphere that blocks most of the sun's rays, but the radiation that comes from orbiting very close to a red dwarf could tear away that type of protection. Plus, the extra-intense activity found around the ultracool red dwarf studied by Williams' team may make it even more challenging. "It's like living in Tornado Alley in the U.S. Your location puts you at greater risk of severe storms," Williams said.